Anonymous types defined with var are not VB variants. The var keyword signals the compiler to emit a strong type based on the value of the operator on the right side. Anonymous types can be used to initialize simple types like integers and strings but detract modestly from clarity and add little value. Where var adds punch is by initializing composite types on the fly, such as those returned from LINQ queries. When such an anonymous type is defined, the compiler emits an immutable—read-only properties—class referred to as a projection. Anonymous types support IntelliSense, but the class should not be referred to in code, just the members. Anonymous types must always have an initial assignment and it can’t be null because the type is inferred and fixed to the initializer. Anonymous types can be used with simple or complex types but add little value to simple type definitions. Anonymous types cannot be used for a class field. Anonymous types can be used as initializers in for loops. The new keyword can be used and has to be used for array initializers. Anonymous types can be used with arrays. Anonymous types are all derived from the Object type. Anonymous types can be returned from methods but must be cast to object, which defeats the purpose of strong typing. Anonymous types can be initialized to include methods, but these might only be of interest to linguists. The single greatest value and the necessity of anonymous types is they support creating single-use elements and composite types returned by LINQ queries without the need for the programmer to fully define these types in static code. That is, the designers can focus significantly on primary domain types, and the programmers can still create single-use anonymous types ad hoc, letting the compiler write the class definition. Finally, because anonymous types are immutable—think no property setters—two separately defined anonymous types with the same field values are considered equal. 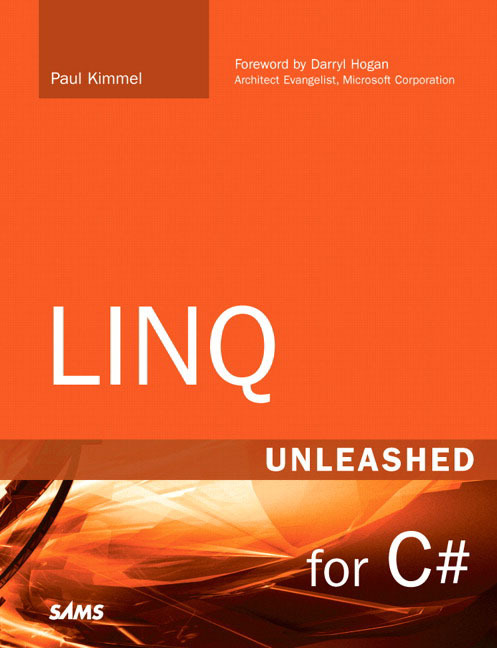 Reproduced from the book LINQ Unleashed for C#. Copyrightã 2008, Pearson Education, Inc., 800 East 96th Street, Indianapolis, IN 46240. Essential LINQ is the first LINQ book written by leading members of Microsoft's LINQ and C# teams. Writing for architects, developers, and development managers, these Microsoft insiders share their intimate understanding of LINQ, revealing new patterns and best practices for getting the most out of it. Calvert and Kulkarni begin by clearly explaining how LINQ resolves the long-time "impedance mismatch" between object-oriented code and relational databases. Next, they show how LINQ integrates querying into C# as a "first-class citizen." Using realistic code examples, they show how LINQ provides a strongly typed, IntelliSense-aware technology for working with data from any source, including SQL databases, XML files, and generic data structures. This includes introduction of .Net framework, .Net framework architecture, role of assembly and GAC. This includes explanation of code security, Principal object, declarative and imperative security, role-based security, code access security and code group. This article explains .Net assembly, private and shared assembly, satellite assemblies, resource-only assembly, ResourceManager class, strong name, global assembly cache.